Every year I love to set some personal goals for myself, alongside the obvious career/study ones. One of the things that I decided to do this year was produce less waste. This is still a learning process for me, and something I’ve been working my way toward for a while now. One of the main things you can do for this is not purchasing as much, learn more in my book Less: A Visual Guide to Minimalism. As part of creating less waste I realised I needed to audit where my waste was coming from. For me a bulk of the waste was coming from food, food packaging, and beauty and oral hygiene products. I am aware there’s areas of my life which I won’t be able to completely eliminate waste from. A prime example is consuming meat products, these are typically wrapped with some kind of plastic to keep them fresh, and I won’t be subbing that at any time soon. Or instant rice is another staple in this house due to the speed of it. So there’s some things which I realised I would be stubborn to give up, and others which are easier to change. I decided that for now I’d sub the things which are easy to change. I don’t like approaching things with an ‘all or nothing’ mentality - as I see that as a great way to set yourself up for comparison and failure. Even if every person who has the ability to just changed 2 things to a more eco-friendly solution, we would see a large difference in yearly waste. With how often we’re cleaning and it’s so easy to go through heaps of products, and plastic bottles. There are a lot of natural alternatives which can still do a great job of getting rid of bacteria in the home. Another thing you can do is buy some ingredients in bulk if you’re planning on making your own, such as citric acid, baking soda, vinegar, and essential oils. For more DIY home cleaning products check out my book Less. I know paper towels are something that we’ve become accustomed to and they’re an easy way to clean up spills and messes in the kitchen. So I have a couple of reusable hemp cloths which you can just keep washing and using, and if there’s a really dirty job that you need to get in and do you can cut up some old cloths, towels, or even clothing that’s beyond repair. Multi-purpose spray bottle. I use mine for home made cleaning products. Long lasting hemp fibre cloths to use instead of paper towels. I have had a plethora of these jars for a few years now which I use to store my dry goods. You can also find them from stores like Kmart in Aus. For use around the house instead of using a plastic water bottle (which I am notorious for). I feel like this isn’t something you can tackle over night, and it’s really going to depend on where you decide to do your shopping. I like to aim to go to the markets, and a zero package shop, and if I need to pick up anything during the week in between market visits, I’ll pop into the super market. When I was looking out for where my food packaging waste was coming from I was noticing lots of products which would be easier to buy in bulk, such as rolled oats, nuts, pasta, quinoa, and various flours. These all came in plastic wrapping, which was easily avoidable. If you’re going to a zero package shop you’ll need to bring things like canvas bags, mesh produce bags, and glass containers. 2L (super large) square jars for bulk dry goods such as oats, pasta, etc! Heavy duty canvas shopping bags. For dry goods I have a couple of cotton muslin bags and some mesh produce bags. These stay in my bag for if we eat food out after the gym etc so that I don’t have to use plastic cutlery. A statistic that I read was that on average, in the US, people use approximately 1.6 straws per person per day. This adds up to the average person using 38,000 straws in their life between the ages of 5-65. Imagine what this looks like in the context of the rest of the world! For me straws aren’t super necessary, so I don’t use them. 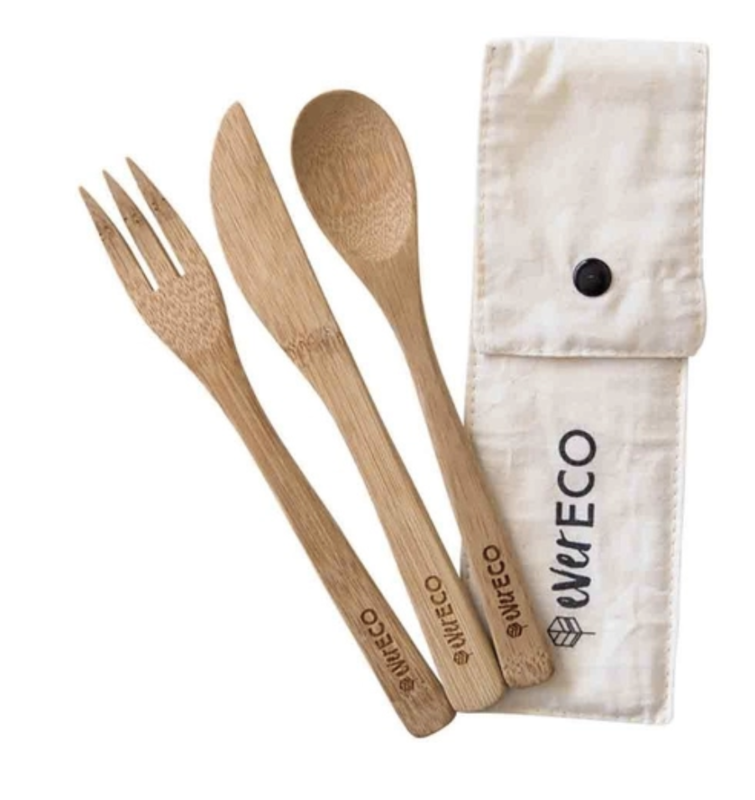 However, I keep a reusable bamboo cutlery set in my bag to use if I’m out instead of plastic cutlery. This gets washed when I get home, and it’s an easy way to use less disposable plastic. My toothbrush, which can be composted or buried in the garden. Mouth wash tablets are portion-controlled and therefore last longer, they come in a re-useable glass bottle. Floss in a re-usable glass container. When you’re finished with your current toothbrush switch over to a bamboo brush that can be composted or buried in the garden. I also swapped to tooth powder instead of toothpaste, which lasts far longer. I subbed out regular floss for natural floss in a reusable glass container, and when I’m finished the floss I can buy a refill and keep using the same container. Another easy little swap I made was using mouth wash tablets. They’re already portion controlled, so they last longer, and you won’t keep buying plastic bottles. I also still require a razor, so instead of using disposable plastic razors I swapped for a safety razor. What I do with the finished blades is collect them up in a metal tin so I can have them collected safely. I’ve been trying out this zero waste mascara, as mascara is basically the only makeup I wear at the moment. Safety razor instead of using disposable plastic razors. Toxin free, broad spectrum zinc oxide powder sunscreen. Multi-purpose bottle brush made from coconut husk fibre. Here are a few of the other zero waste (or less waste) swaps I made in the home over the last 6 or so months. 100% Natural, with olive oil, solvent and dye free, very gentle for skin. Can be used for skin or house work tasks. Super-concentrated floor cleaner fragranced with natural essential oils. Made from natural biodegradable coconut fibres. Compost bin made from recycled plastic. Overall there’s still lots that could be optimised in my home, but I’m taking it one step at a time. As something runs out I ask myself, “Is there a better alternative to this?” and look into it more. It doesn’t have to be a painful process, and can be as simple as thinking, “Where does this product end up after I put it in the bin and what else could do the job instead?”.